Scan the label on an energy drink or energy shot, and you’ll likely see guarana: an ingredient twice as caffeinated as coffee, and a natural product of the Amazon. For centuries, natives there have used it medicinally, to suppress appetite, and for extending physical endurance. What is guarana? The substance hails from the seeds of the guaraná plant, hence the name. 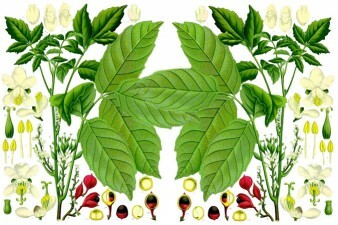 Guaranine is the term for the caffeinated element in guarana, which is chemically identical to caffeine in coffee, tea and chocolate. Where does guarana come from? Native to the Amazon basin, guaraná vines bear clumps of grape-size, Christmas-red berries and can climb as tall as 35 to 40 feet. When the three-sided guaraná fruits ripen, the capsule splits to reveal a black seed poking out of a white aril – they look like arm-length clusters of Muppet eyes. (Native legends say that the first guaraná plant sprouted from the eye of an infant god.) Native tribes have harvested guarana for centuries. The seeds are dried, ground, and brewed into tea or processed into an extract. Brazil is the leading supplier of guarana extract and powder, which are added to foods and beverages as a caffeine-boost. How much caffeine does guarana yield? 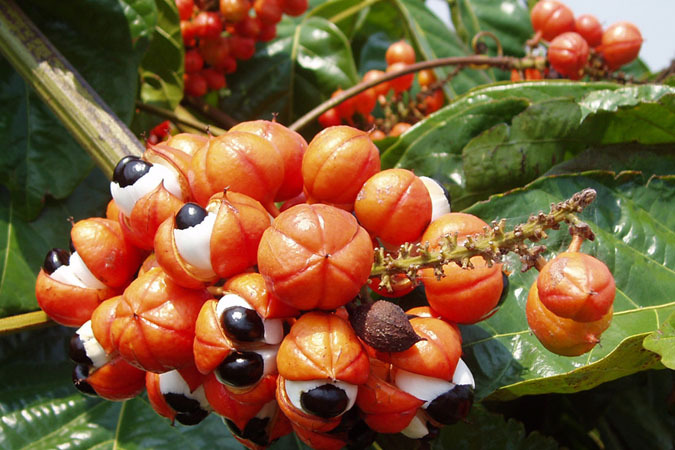 Guarana seeds are twice as caffeinated as coffee beans, about 4% caffeine by weight (coffee has 1-2% caffeine). But it’s difficult to know how much guarana a product contains. Like coffee and tea, guarana is naturally caffeinated, so U.S. regulations do not require the amount of guarana to be listed. If caffeine is listed separately, it typically does not include the extra caffeine that comes from guarana or guaranine. What else does guarana contain? 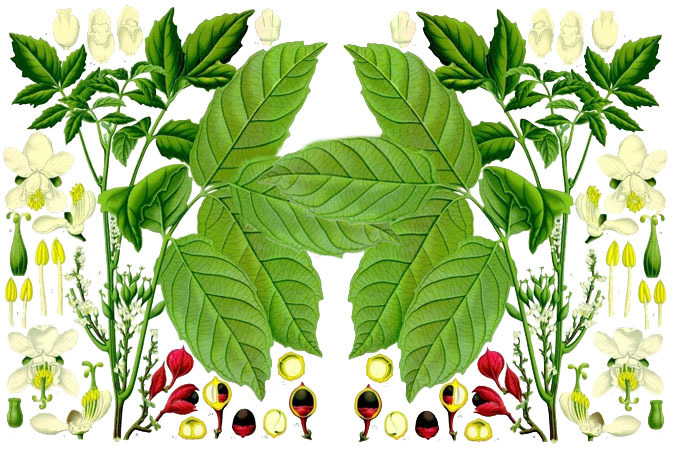 Guarana also contains the caffeine-related stimulants theobromine and theophylline. Some studies show guarana yields antioxidant effects. It’s classified as GRAS, generally recognized as safe, by the U.S. Food and Drug Administration (FDA). We tend to think that more is better, but that’s not the case with caffeine. 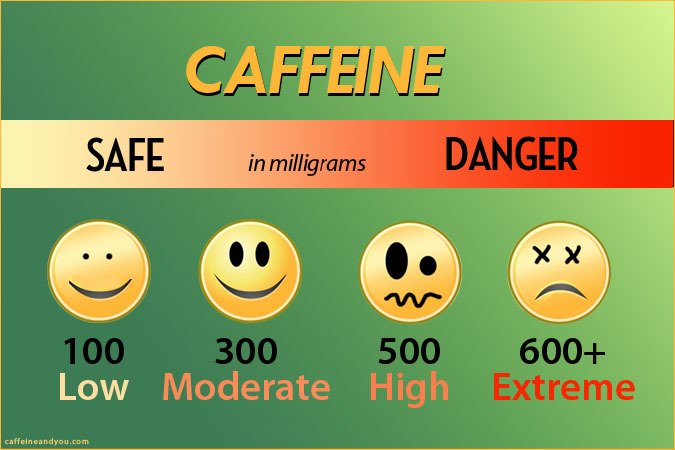 Caffeine is a biphasic drug; low to moderate doses are considered safe, while high doses can create adverse effects. 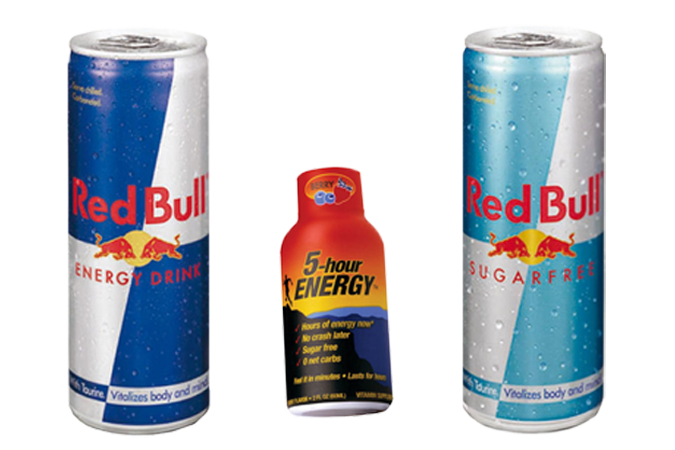 Energy drinks range from moderate to extremely high levels of caffeine. What are energy drinks? The term “energy drink” is a beverage-marketing category. The FDA classifies energy drinks (and energy shots) as “dietary supplements.” They contain caffeine and other ingredients intended to boost physical and/or mental energy. What’s the difference between energy drinks, energy shots, and sports drinks? All three are designed to boost or restore energy. Energy drinks are like carbonated soft drinks, but more caffeinated. 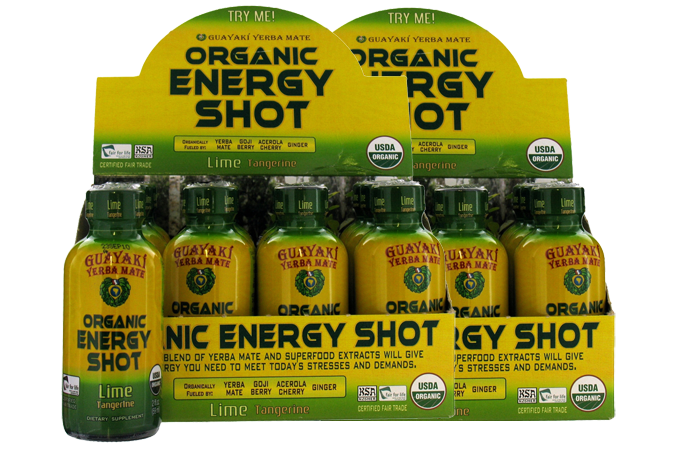 Energy shots typically come highly concentrated in 2-ounce bottles, and are not carbonated. Sports drinks contain ingredients to rehydrate, like electrolytes and nutrients lost in exercise, and contain no caffeine. 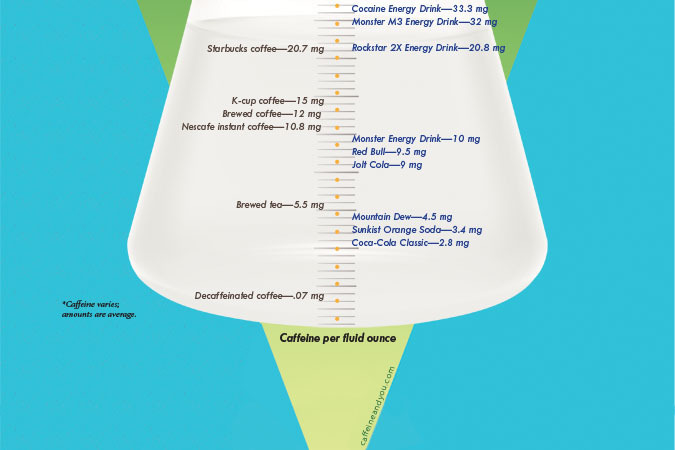 How much caffeine do energy drinks and shots contain? There is no standardized amount of caffeine for these products, and no limit. Energy drinks go from 80 mg of caffeine, which is comparable to coffee, up to 500 mg. They come in containers ranging from 8 to 20 fluid ounces. Formulas matter, too: Rockstar, for instance, makes more than a dozen varieties, with caffeine ranging from 120 to 240 mg per can. 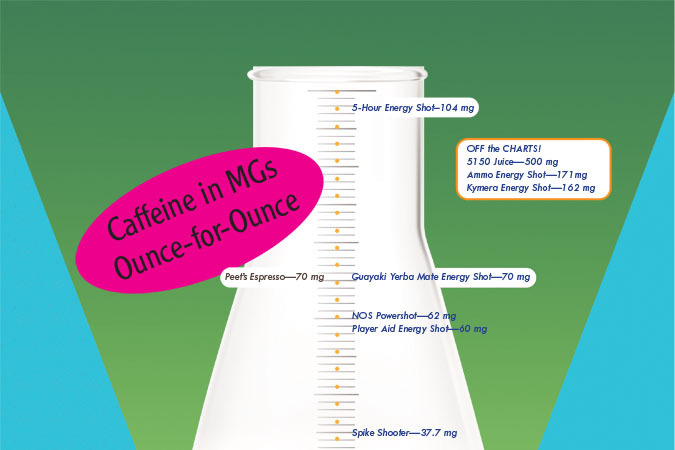 Energy shots span 100 to 500 mg of caffeine – as much caffeine as one to five cups of coffee, but swallowed in two gulps. 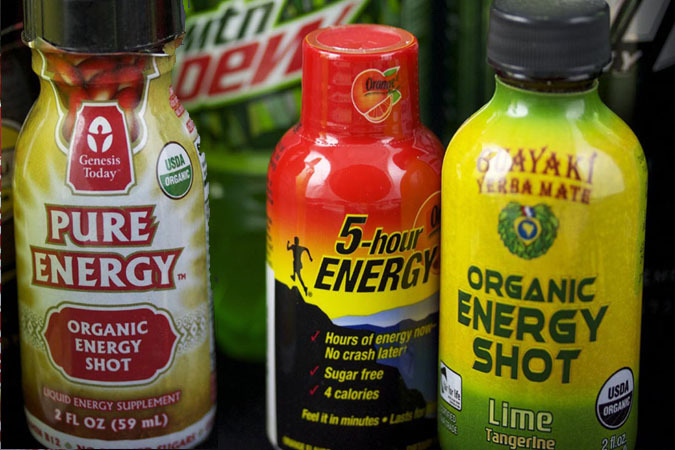 How much sugar do energy drinks and energy shots contain? Most energy drinks are sweeter than 12-ounces of Coca-Cola Classic (with 39 grams of sugar), and also come artificially sweetened. Energy shots are artificially sweetened, though some contain up to 7 grams of sugar. What else do energy drinks and shots contain? All contain caffeine; some add guarana and yerba mate for their caffeine content. Other ingredients, like taurine and B vitamins, are shown in the next section. Their impact in energy drinks is questionable; quantities are usually small, and research on energy drinks has been sparse. Are energy drinks and shots safe? The biggest danger comes from overconsumption of caffeine, and mixing with alcohol. Many, but not all, of the added ingredients are recognized as safe by the FDA.